Anyway, I’ve started thinking about what makes reading and eating at the same time so enjoyable, other than the straight facts of FOOD and BOOKS. Combining two of life’s greatest pleasures certainly is a factor, but for me personally, I think there’s something else there as well. A lot of it for me is the comfort aspect, I think. 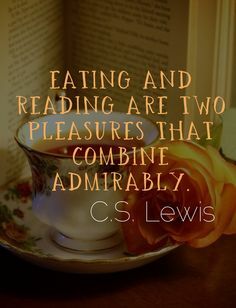 Both food and books have always been my top sources of comfort (one of the many reasons it’s so hard for me to ever lose weight—I love food and I’d rather read than exercise) and the combination of the two is just utterly heavenly. I’ve gotten away a little bit from rereading as much as I used to, thanks to blogging and wanting to have a good amount of new content for reviews (and BEA, can’t forget BEA), but back in the day I would read the same books pretty much over and over. This constant rereading was due to a few factors: first, I had no money of my own to purchase new books (or the means to get to the bookstore on my own), and when I did (i.e., college), I had very limited space to store them; second, I’ve always been a pretty quick reader, so even when my parents or grandparents did treat me to half a dozen books at Borders, I’d finish them within two weeks and then feel too guilty to ask to go back again; and third, I know what I like and I like what I know, and I’ve always been that way—so I never really had any problem rereading my books, and in some cases preferred rereading old favorites to trying anything new. In fact, I remember finding it quite shocking that some of my friends never reread books. How do you know which book is your favorite, then, if it’s not the one you’ve read the most??? Honestly, some people. Food, too, has always been a comfort thing for me. This frustrates my husband to no end—he’s all about the variety in foods, and I’m all about consistency. I could eat the same thing for dinner all week and be perfectly content (as long as it’s delicious, of course) whereas he would rather eat something mediocre all week as long as it was different each time. I’m pretty picky, and nothing devastates me like ordering something that sounds amazing at a restaurant and finding that I don’t like it. To me, food disappointment is the absolute worst kind of disappointment, because food is so important to me. It sounds silly, but it’s true! Anonymous Facebook friend: Tea. For everything there is a season, and there is also a tea. Mystery book? Jasmine tea. Sad book? Green tea. Comedy? Light black tea. Anonymous Reddit commenter: I enjoy tea or coffee while I read. Though not fully snack, in the fall and winter I enjoy a pipe and mulled wine by the fireplace while I read, it's quite a relaxing thing to do. Anonymous Facebook friend: Fruit juice is good. Like those bolthouse juices. Then you feel healthy and well-read. Anonymous Reddit commenter: Always tea. Made with organic tea leaves and a dash of milk. And always in a matching teapot and teacup. What’s your answer? I’ll update this post as I get more answers from friends and strangers alike, but tea seems to be a big one! I’ve never been a tea person so I don’t really get this, but to each their own! Based on the comments I've gotten here and elsewhere, tea is the number one reading accompaniment. I'm not all that surprised, honestly. Coffee, wine, and cocoa are also popular, particularly on rainy/snowy/cold days. Popcorn has also been making much more of an appearance than I would have expected. Anonymous Facebook friend: English tea with the Brontë sisters; cocoa or a chai latte and pumpkin cookies (fall only) with Harry Potter. Anonymous Reddit commenter: Popcorn, made in a big pot on the stove, is my favorite reading snack. I'll have water and either coffee or yerba mate nearby when reading during the day, substitute wine for the caffeine in the evenings. Anonymous Facebook friend: Lately I've been eating popcorn while reading a book. I also often eat lunch while reading a book, so that is a variety of things. Coffee goes with everything. Wine is a favorite too. Anonymous Reddit commenter: Coffee and either nuts (almost any easy kind) or dried cranberries. Mmmm. Anonymous Facebook friend: It depends more on the weather than the book, coffee or tea if it's cold/winter/raining, iced tea or soda if its warm/summer. As for food - sweets or basically any munchies. Tell me in the comments what your favorite reading snack or drink is! I read in restaurants if I'm eating by myself, but otherwise, I hate eating while reading. I'm too worried about getting food stains on the books, or getting the screen dirty if I'm reading on my Kindle. Oh, I'm with you! I love eating and I love reading and I LOVE to do them at the same time. If only I could get at least a little bit excited about exercise. Ugh. Popcorn is one of my favorite reading snacks! A BIG bowl with some fancy cheese slices alongside it I'm a happy girl. I do also love tea while reading - and the season affects what kind. I could down gallons of iced tea during the hot months! What a fun subject for a post. I try not to eat while reading or watching movies or TV unless I've already portioned my amount of food, otherwise I'd eat way too much. You must have better self-control than I do! Hah! Nope, not much, hence the problems losing weight :) Although it does help when I'm at work and I've already got my pre-portioned lunch and snacks, like you said. And come to think of it, I'll usually have a bowl of something rather than, say, eating straight from a box or bag, so I suppose that counts as pre-portioned! My go-to snack while reading is...cheese. Not sliced cheese, mind you, but block or even proper wheels of Gouda or whatever. When I was a kid, my perfect rainy day went like this: go to library and check out stack of books. Come home and bake chocolate chip cookies. Sit on couch and read first chapter of books while eating warm cookies, until I discovered which book I most wanted to read first, usually because I got halfway through the book before remembering I was reading first chapters. This is still kind of my ideal, although life is a bit too busy for that to happen much. I usually just have some sort of drink on hand, like water or tea. Tea is my favorite choice. Not very exciting, but I don't want to get the pages dirty. I love having a snack while I am reading. I am just nerdy enough to sometimes match my food to the book I am reading. Like the little house books, eating hardtack (or crackers because who has hardtack lying around?) and beef jerky. I am actually a little embarrassed as I right this ha ha! I like getting into my books and food is a way to do that. Writing Pearls, you are not alone! I do the same thing. If there is a particular food the characters in my book are eating I sometimes find that eating the same thing myself enables me to feel like I'm really getting into the story.